This admission of military application by the Ministry of National Defense is a significant departure from official Chinese talking points around, which emphasized the without admitting the clear dual civil-military utility of China’s construction in the Spratly Islands, let alone the overtly military installations such as bunkers and long-range sensors. Back in 2015, China’s Ministry of Foreign Affairs would emphasize that the bases being built in the Spratly Islands were mainly to support navigation, search and rescue, and other civilian safety needs, with minimal defensive military construction treated as an afterthought. As the islands neared completion, official Chinese media emphasized the lighthouses being built and China’s commitment to providing safety for international navigation in the South China Sea. This argument was spurious even before the giant runways, ports, bunkers, and sensor arrays that take up most of the reclaimed land China built up in the Spratlys became obvious since the islands are so far from the main South China Sea lanes that most maritime traffic would never be close enough to see their lighthouses. 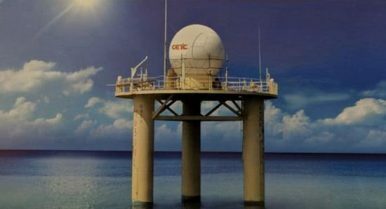 These mobile and deployable platforms may turn out to be important complements to the network of long-range sensors and arrays that China has already constructed on its major bases in the Spratly Islands. Those sensors are likely trade fidelity and precision for extended ranges, making them less useful close-in to islands and reefs where China may want to monitor the presence of regional fishermen and law enforcement vessels. As Peter Dutton of the U.S. Naval War College points out, even China’s large coast guard and maritime militia fleets are too small to effectively patrol the South China Sea; even a generous accounting suggesting China has just one vessel for roughly every 2,700 square miles of water over which China claims jurisdiction. To use its fleets more effectively, platforms like these might provide a more accurate picture of where concentrations of regional fishermen or law enforcement vessels are and are not. China could then use this information to cue its own coast guard and maritime militia fleets to conduct “rights protection” missions against rival claimants without wasting assets to patrol empty waters.